بتير is a small village and UNESCO world heritage site south-west of Jerusalem. Located near Beit Jala within the Bethlehem governorate the ancient terraces have been irrigated for more than two millennia, forming a unique culture that is being preserved until today. 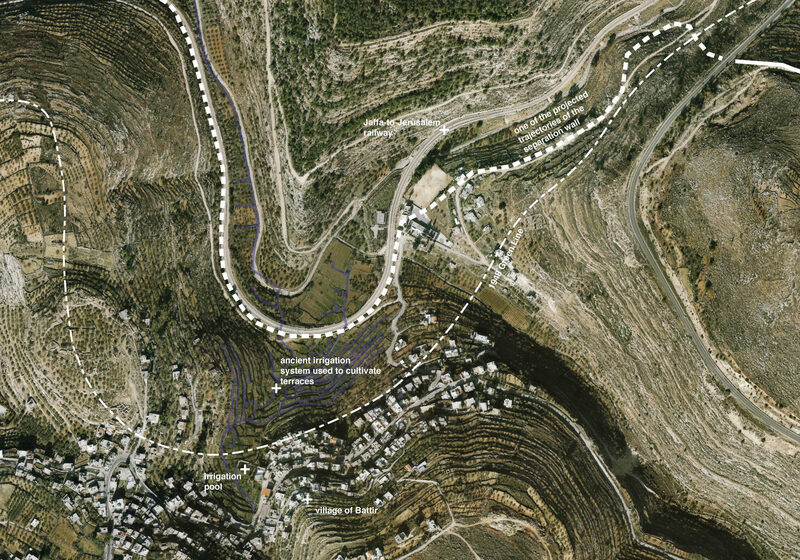 As Eyal Weizman notes in his essay “The Landscape Against The State”, it is the forensic documentation of this unique landscape and the effects that the construction of the wall would implicate that prevented the erection of the Apartheid wall once the case was brought to court. Landscape, here, is a unique set of socio-spatial relations that cannot be replicated elsewhere, making this landscape a unique spatiality. The landscape itself revolves around various lines: railway lines, legal lines, such as boundaries and borders, irrigation lines and the lines that those who practice the landscape impress onto the ground. Throughout this walk we will attempt to read and trace the lines impressed into the ground and, potentially, leaving our own imprints in Battir.